The third and final day of Viridiant’s Celebration of Sustainability includes our family friendly, community-focused Earth Day 5K Race Without a Trace, showing off the best the city has to offer. Run, walk or stroll down around Belle Isle and Brown’s Island and see the beauty of the James River and its downtown surroundings. Learn easy ways to help the environment along the course and finish at one of the best events of the Spring. That’s right, this race, presented by VHDA, takes place in conjunction with Party for the Planet at Historic Tredegar, so when you cross that finish line, you’ll be steps away from the festival’s live music, vendors, food and drink, demos and plenty of educational information and activities. The race name says it all – our goal is to combine one of the city’s most environmentally friendly races with the most fun possible. Let us show you what the riverfront is all about! Families, children, strollers (no wider than 41 inches) and well-behaved, leashed dogs are welcome! Benefiting Viridiant, formerly EarthCraft Virginia. 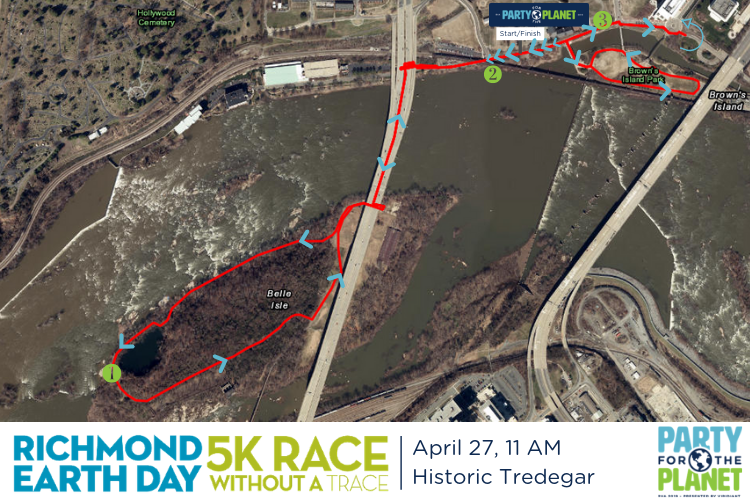 This race starts and finishes at Historic Tredegar. Parking maps will be provided prior to the race. There are two options for packet pick-up before the race. Since we’re celebrating Earth Day, why not ride your bike or walk to the festival? We’ll have a FREE BIKE VALET provided by I am RVA. Street parking is available, but on a first come, first served basis. Parking is also available in the Federal Reserve lot on Bragg Street for $5. We encourage you to ride your bike, take public transit, or carpool to the event. Yes, this race will be timed through Mettle Events! In the past, this event has been clock timed with an overall clock and volunteers collecting times. Participants received an email with finish times after the event. If you were any closer to the river, you’d be swimming. The Earth Day 5K Race Without a Trace shows off the urban riverfront by circling two of Richmond’s most well-known islands – Belle and Brown Islands. Learn easy ways to help the environment along the course with signage and facts along the course, and finish at one of the best events of the Spring. That’s right, this race takes place in conjunction with Party for the Planet at Historic Tredegar, so when you cross that finish line, you’ll be steps away from the festival’s live music, vendors, food and drink, demos and plenty of educational information and activities. Walkers, strollers (max width of 41 inches), and well-behaved, leashed dogs are welcome! Will we run if it rains? Yes, we’ll be running rain or shine! Dress accordingly. A large portion of this is a trail run around Belle Island so if there has been any recent rain, there will be muddy spots. Are there awards for winners? What about raffle items? How will I get to the Party for the Planet after the race? You’ll already be there! This race is hosted in conjunction with Party for the Planet so you’ll finish just steps away from the festival’s live music, vendors, food and drink, demos and plenty of educational information and activities. There will be port-a-johns at the start/finish line as well as restrooms at The American Civil War Museum at Historic Tredegar. Will there be photos taken of all runners at this race? We will have a photographer at the event, but we will not have a photo service to get photos of all runners. Can I bring my stroller? What about my pet? Strollers (no wider than 41 inches) and well-behaved, leashed pets are welcome. Yes! Kids are welcome to run if they are up for the 3.1 mile run. If you want to run but your kid doesn’t (or he/she is not quite ready for that kind of distance), have a family-member or friend take him/her to the festival to enjoy the various kids activities while you get a run in! How is this race environmentally friendly? The Earth Day 5K Race Without a Trace has made every effort to be environmentally friendly with measures including minimal printing of flyers and promotional materials, reusable course signage, bib recycling, organic t-shirts, recycling at the festival, clean-up of the course before and after the race, and very minimal power usage. 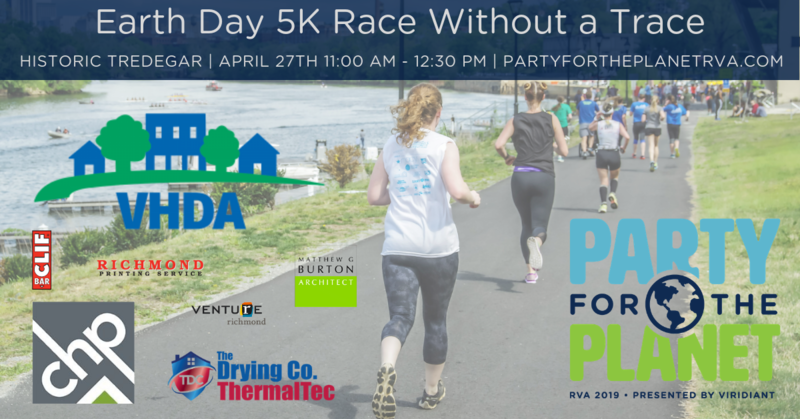 Being held in conjunction with Party for the Planet also helps to encourage runners and walkers to participate in the festival activities and support sustainability in RVA. What are the hours of Party for the Planet? 11 AM – 3 PM, all festival details can be found at www.partyfortheplanetrva.com. Who is hosting the 5K? The host of the 5K Race Without a Trace is Viridiant, formerly known as EarthCraft Virginia. Viridiant is a nonprofit organization committed to supporting sustainable building processes through education, consultation and certification. Through these efforts, Viridiant helps to set a path for businesses and homeowners to create structures that are more affordable, more livable and more durable. Who are the race sponsors and partners? If you were any closer to the river, you’d be swimming. 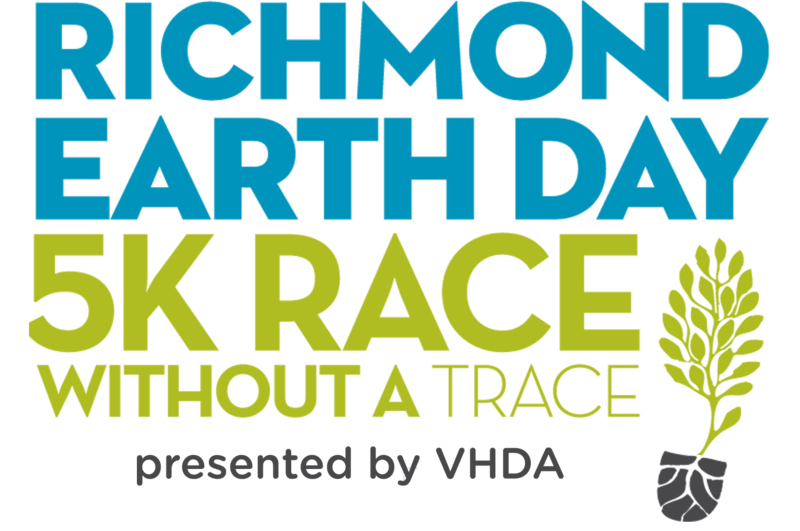 The Earth Day 5K Race Without a Trace shows off the urban riverfront by circling two of Richmond’s most well-known islands – Belle and Brown Islands. Learn easy ways to help the environment along the course with signage and facts along the course, and finish at one of the best events of the Spring. In April, Viridiant will host a weekend-long celebration of building science and sustainability with numerous sponsorship and marketing opportunities for our friends and supporters. Click below to see the various event sponsorship opportunities. Interested in all three events? Maximize your sponsorship, receive top benefits, and reach a variety of audiences by supporting all 3 events as a Sustainable Weekend Sponsor. Thanks to the folks who came out for our 6th Annual Earth Day 5K Race Without a Trace! We had a blast, and we hope you did, too.